NASA’s OSIRIS-REx spacecraft, which is currently on its way to grab a chunk of an asteroid, has returned a stunning image of Earth and the Moon in the process. 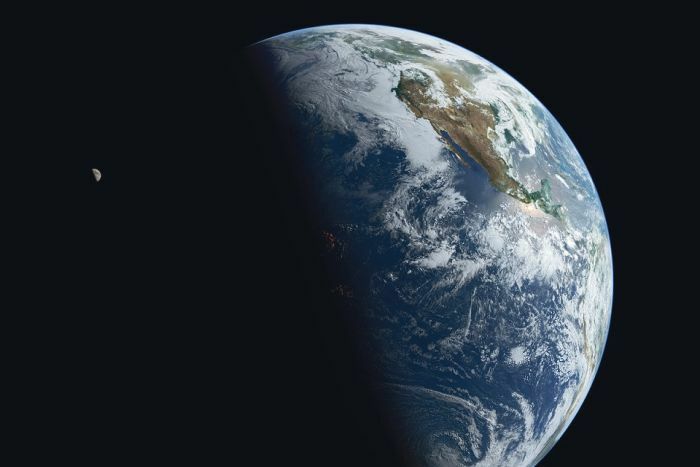 The spacecraft snapped the image on October 2, 2017, just after it made a flyby of Earth, although the image has only just been released by NASA. At this time the Moon was almost about 390,000 kilometers (240,000 miles) from Earth. OSIRIS-REx took this image from a distance of more than 5 million kilometers (3 million miles) from Earth, or more than 13 times the Earth-Moon distance. It was taken by combining three images from different color wavelengths. The Moon was brightened to make it more visible. This image as a whole is truly amazing. The spacecraft was launched on September 8, 2016, but in order to reach its target, it then orbited the Sun for a year before flying past Earth to get a speed boost from our planet’s gravity. It made its closest approach to our planet – an altitude of 17,000 kilometers (11,000 miles) – on September 22, 2017, and took this image 10 days later. This will give it enough speed to reach Bennu, with the spacecraft due to rendezvous with the asteroid in August 2018 at a distance of about 320 million kilometers (200 million miles) from Earth. In total, the spacecraft will travel 7.2 billion kilometers (4.5 billion miles) to reach Bennu. Once at the asteroid it will use a robotic arm to collect a sample in July 2020. In March 2021, the spacecraft will begin its journey back to Earth, and in September 2023 the sample will be delivered in a capsule back to Earth – the biggest sample returned since the Apollo missions. It’s hoped this sample could tell us more about the origins of life on Earth. That image above isn’t the only time we’ve seen Earth and the Moon from space. Quite a few other spacecraft have captured similar views, showing the distance between our two bodies. In 1992, for example, the Galileo spacecraft captured an image of our two worlds on its way to Jupiter. In 2011, the MESSENGER spacecraft took an image of Earth and the Moon from Mercury. And also in 2011, the Juno spacecraft took a picture of Earth and the Moon on its way to Jupiter.